While a bottle of wine is an easy gift to give, it’s often irksome to wrap. 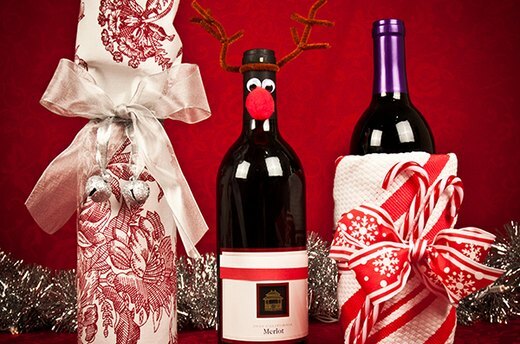 Whether you’re attending a holiday dinner party or visiting the in-laws, we have ten creative wine wrapping ideas that will take the quintessential hostess gift from boring to beautiful. In lieu of a traditional gift bag, wrap up a bottle of wine in a pretty cloth placemat. The soft, flexible material conforms to the bottle’s contour, which makes wrapping a cinch. Lay the bottle lengthwise along one side of the placemat and roll it up, securing it with several pieces of tape. Tie a bow around the neck of the bottle to hold the placemat in place. Add a few simple trinkets such as glittery jingle bells to finish the festive wrapping. Use twigs from your own yard to transform an ordinary wine bottle into a unique and whimsical hostess gift. Place a rubber band around the body of the bottle; the rubber band will hold the twigs securely in place. 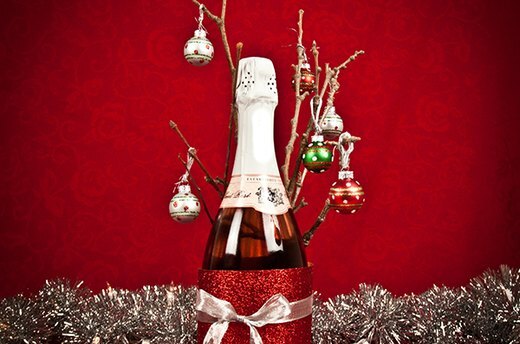 Insert twigs of various lengths between the rubber band and the wine bottle and arrange them in a manner that allows for the hanging of small, decorative ornaments. 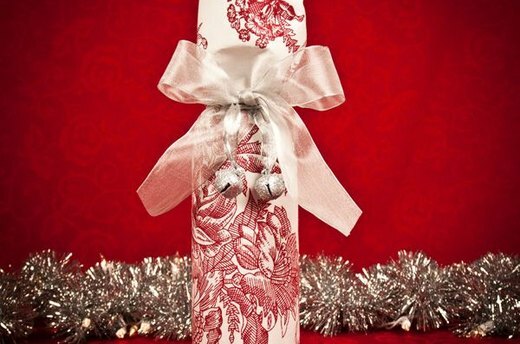 Wrap decorative paper around the body of the bottle—note, the paper should be wide enough to conceal the rubber band and the lower portion of the twigs. Complete the wrapping with a small bow. 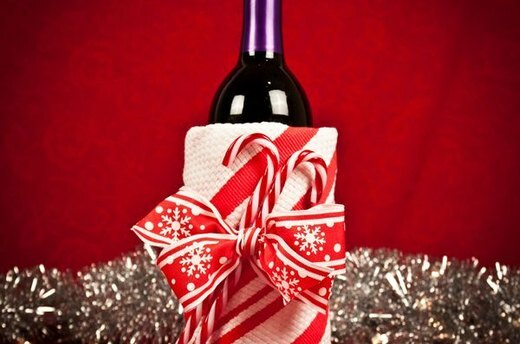 Wrap a bottle of red wine in a dish towel for a festive and functional two-in-one hostess gift. 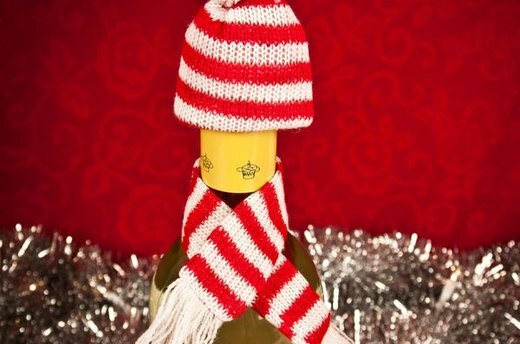 To create the candy cane effect, fold a red and white striped dish towel on the bias and wrap it around the bottle. Secure the towel with a generous amount of double-sided tape before adding a pretty bow. Finish the spirited wrapping with a few candy canes for a gift that’s sure to show your hostess how much you appreciate her. You can amp up the personality of a hostess gift using just a few simple craft supplies. Malleable pipe cleaners make adorable antlers, especially when paired with googly eyes. Wrap one pipe cleaner around the collar of the wine bottle and twist the ends so that the pipe cleaner stays securely in place. Use a pair of scissors to cut small pieces of an additional pipe cleaner and twist them around the initial pipe cleaner to complete the antlers. 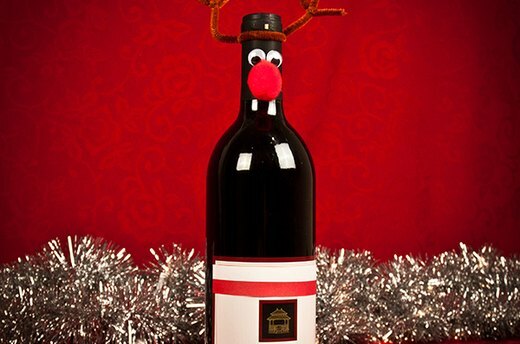 Hot glue two googly eyes and a red pom pom nose to the neck of the bottle and your hostess gift is holiday party ready! Top off your hostess gift with a knit cap and scarf. If you only have a few minutes to make your hostess gift party ready, consider purchasing a miniature knit hat and matching scarf from your local craft store. Whether they’re handmade or purchased, these simple details make for a festive presentation. 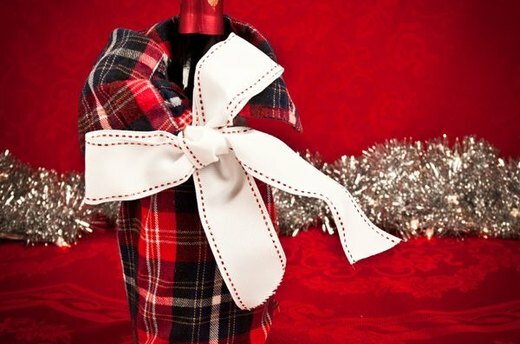 Instead of purchasing an overpriced gift bag, repurpose an old dress shirt to wrap a bottle of wine. Snip off the sleeve of an old dress shirt with a pair of fabric scissors and use a hot glue gun or a needle and thread to seal the edge. Slip the bottle into the sleeve and tie a ribbon around the cuff to complete the budget-friendly (and eco-friendly) packaging. 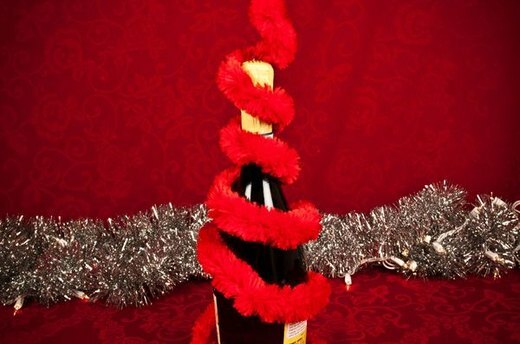 An oversized pipe cleaner transforms an ordinary bottle of wine into an imaginative hostess gift that is Seuss-like in its simple whimsy. Starting from the base, wind the pipe cleaner around the bottle and be sure to leave an excess at the top. Slightly bend the tip of the pipe cleaner and attach an ornament or other festive trinket. 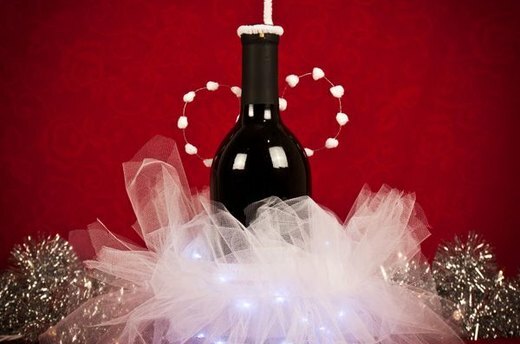 Dress up a bottle of wine with layers of tulle, a pipe cleaner halo and a string of battery powered Christmas lights to create an angelic hostess gift. Quick tip: after wrapping the lights around the bottle, conceal the battery pack by securing it to the bottle with a generous amount of tape, then layer on the tulle. This will not only veil the battery pack from view, but it will also create a glowing effect as the lights are underneath the tulle. Create the halo by wrapping a white pipe cleaner around the collar of the bottle and molding it into the iconic circular shape. And what’s an angel without wings? Use wired ribbon to shape wings and attach them to the bottle with hot glue or double-sided tape. If you don't want to give an over-the-top gift, opt for natural paper, raffia and burlap for a more organic take on gift wrapping. 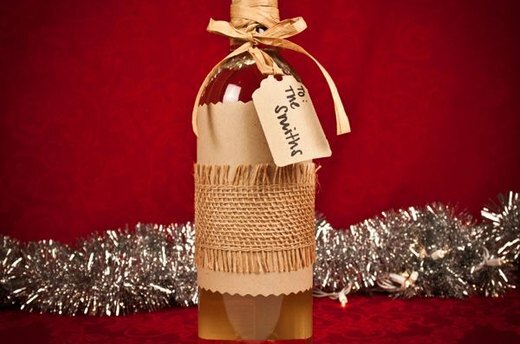 Use decorative scissors to cut natural paper to wrap around the body of the bottle and tape it in place. Layer a strip of burlap over the paper to add a touch of texture. Finish the wrapping with a raffia bow and a personalized gift tag. 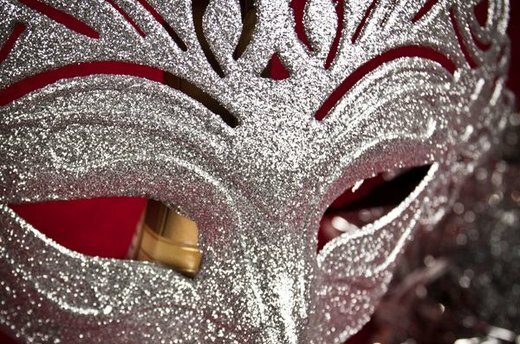 Glam up a bottle of bubbly with a glittery mask for a festive New Year's Eve gift. Perfect for a host who loves all things glamorous, this two-in-one gift is especially fitting for a masquerade themed New Year's soiree. Secure the mask to the neck of the bottle using heavy duty tape to ensure that it doesn't fall off before the host is ready to open the bottle.